Den bloggen börjar på samma sätt som denna, med små förbättringar av en körbar veteranbil. Välkomna! Does this look like a stationary engine or a boat motor to you? Despite common belief it seems as the supercharged type 170 was a stationary engine for high altitude rather than a Sturmboot motor. Before continuing with Porsches post war development I want to go back in time to 1943 as new information has came to my attention. A consultant at my workplace, and fellow vintage Porsche fan, did hand me a book a week ago. It was "Driving in its purest form" by Conradt. He had found an interview with Ferry Porsche from 1989 in the book that he wanted me to see. In the interview Ferry mentions a project for a stationary engine for high altitude using a Roots compressor to compensate for the power loss due to the low air pressure. 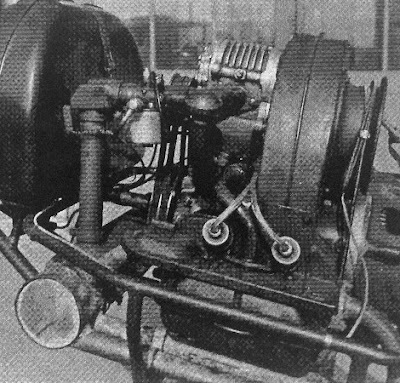 He also mentions that such an engine later was installed in his private kdf cabrio (as pictured in the "origin of the species" book by Ludwigsen). As I see it, it's clearly the type 170 Ferry refers to. It all makes sense: The weight was too high for a Sturmboot application and the engine canopy (as seen above) did make it feel like a stationary engine. 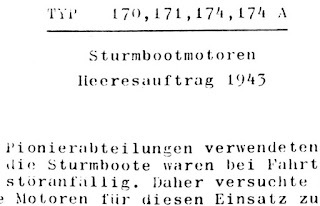 If all this is true the 170 was not part of the Sturmboot program, despite what it's said on the typewrited copies I got (that originates from the Porsche archives). Or, could it be so that the first version, with the supercharger on top, was for the Sturmboot program? Perhaps when they realized it was too heavy they reused it for the high-altitude stationary motor request. 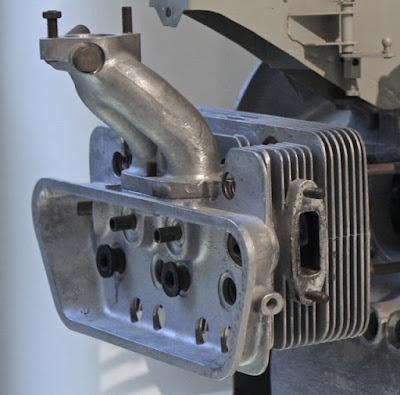 It's all goes to show that there are still things to discover in the early history of VW/kdf/Porsche engines and if something seems a bit strange you are probably missing a piece of the puzzle. When the war was over Porsche had re-located to Gmünd, Austria and plans for an own sports car started to take form. Almost all of Porsches work had been done for customers, thus they didn't possess much in terms of intellectual property to base their sports car on. 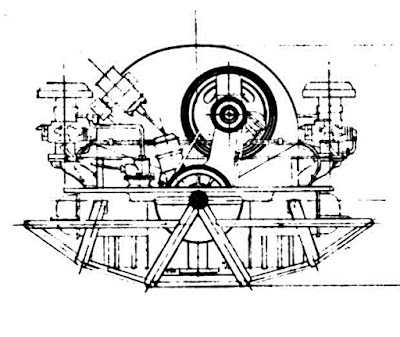 The whole Berlin-Rome program, including the type 115 engine, was designed with Volkswagen Werk as customer and the Sturmboot program was done for the German military forces. Thus, Porsche did not own these designs. 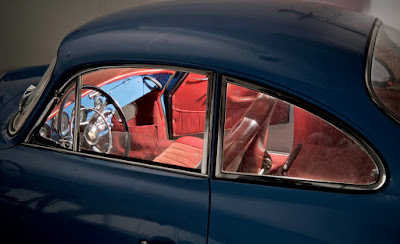 The lack of own intellectual property was a problem already before the war as Porsche was not allowed to use kdf-designs as a base for any private sports car project. Thus Porsches stillborn attempt of a sports car in 1938 (type 114) had to be designed from scratch. After the war the situation was a bit different. Volkswagen Werk was now run by the British forces who heavily relied on Porsche knowledge to keep developing the beetle. Also there were some overlap in the staffing. Gustav Vogelsang, the chief engineer for engine development at Volkswagen in the 40's, seems to have worked in parallel also for the Porsche company. According to the book "Porsche - Origin of the species" by Ludwigsen, Vogelsang fled from Germany to join Porsche in Gmünd late 1944, but seems to have re-located to Fallersleben, and his position as head of the engine development at Volkswagen, some years later. 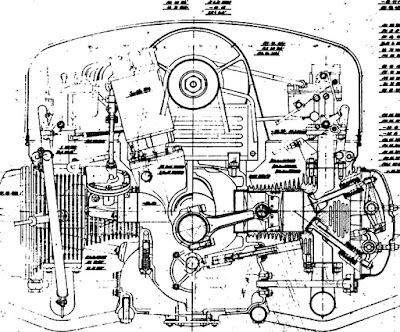 So when it came to re-use Volkswagen parts Porsche had a friendly counter part to negotiate with. But when it came to the re-use of wartime designs I imagine the situation was more tricky. This is only my speculations, but having Ferdinand prisoned in France for war time crime was probably not a good starting point for negotiations to re-use military designs for commercial purposes. But, as they had the knowledge, the easiest way was probably to do new drawings using new project numbers. It might not be a coincident that the first attempts to develop a new Porsche sports car engine looks more or less like a re-make of the Sturmboot program. Stay tuned for part 2 and I'll explain more! The Type 174A engine. From this angle it looks like a pretty normal kdf engine with dual carbs. The last in the row of Sturmboot prototypes is the 174A. In the specifications I have seen it is said to be a normal kdf-engine, but with higher compression, larger intake valves and dual carburetors. But, was there perhaps something else done? I want you to put yourself in the shoes of the Chief Engineer for the Sturmboot engine program. Your first attempt, 170, was a rather simple execution: Slap a Roots supercharger on to an existing engine. Simple, but in the end too heavy for the application. Your next try, 171: An engine that is totally re-designed only to be able to get hemispherical combustion chambers. A nice solution from a design point of view, but tooling up for a entirely new engine, aimed for a very narrow application, would have been insane. So, what to do next? 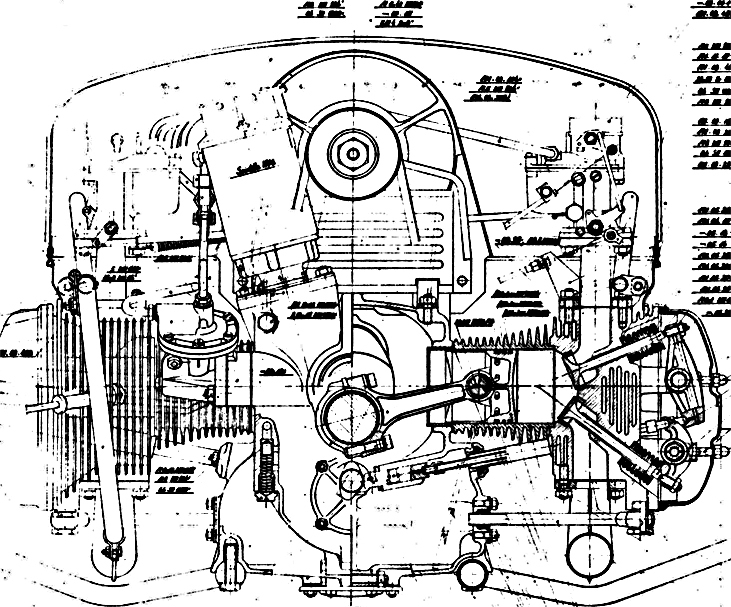 Obviously there is a resistance in increasing the cylinder volume* and there is also a belief that hemispherical combustion chambers is the way to increase power in a normally aspirated engine (perhaps it was also deemed as a necessary measure to be able to raise the compression with the war-time fuel). On top of that, the new engine must reuse as many kdf parts as possible. If only there was a way of tilting the valves while still retaining the overall lay-out of the kdf engine. Hmmm…. Wait a minute! If I tilt the valves in the other direction? Never mind the intake valves, perhaps only tilting the exhaust ones would be sufficient to get a much better combustion chamber? If we can find a way to get the pushrods on the exhaust side to work despite the angled valves, we can have a nice high compression engine, reusing most of the kdf parts. Then we only need tooling for new heads and we don't even need to touch the casting of the case! While we're at it we can add dual ports on the intake side for better flow, much like the early E60 engines from the 1930's. This, ladies and gentlemen, describe the design principles of the type 369 head, a design that would follow Porsches pushrod engines in all 356 and 912 up until the late 60's. Viewed from this side we see that this is not normal kdf-heads. They have dual ports and very different valve covers (I did the yellow high-lightning for illustrative purposes). Look at the picture above of the type 174A. I have highlighted the shape of the valve cover and the dual port intake. Then compare it with the very early type 369 engine found at the Prototyp museum in Hamburg. I think the similarities are striking. 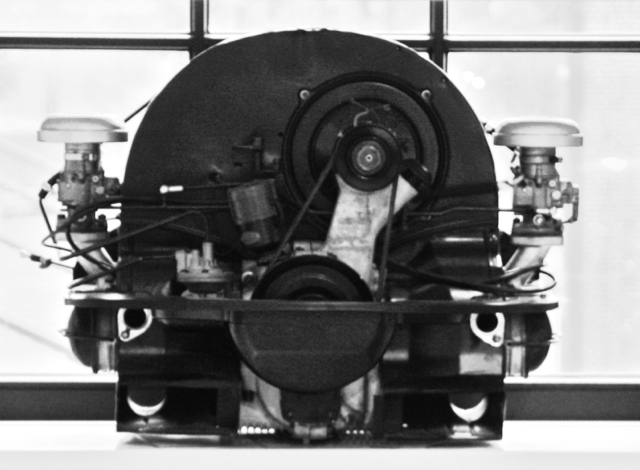 An early type 369 engine from the Prototyp museum. Compare this to the previous picture. To me it seems as the type 174A was the true father of the Porsche 356 heads. Could it be that the 369 engine launched by Porsche in the late 40's was a carry over from the war time type 174A? 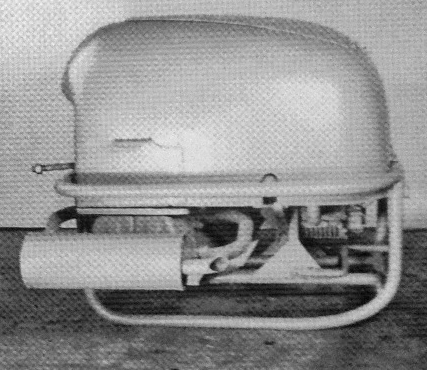 Phil Carney (356 Registry vol 32, nr 6) writes that it's "quite possible" that the type 369 heads "were initially designed during the war". Not exactly heavy evidence, but I can't find any information that goes against my theory that the type 174A and 369 heads are closely related. Again, any additional information that can support, or destroy, my theory is very welcome. 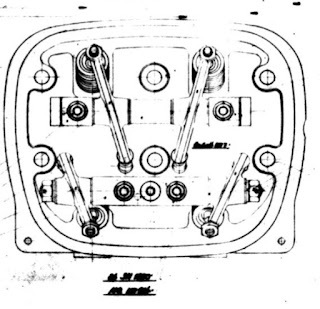 To me the sketch of the type 174A is a good indicator that the Porsche 356 pushrod engine had its origin in the Sturmboot motor type 174A from 1942/1943. *The cylinder volume was already increased a bit from 998cc to 1131cc, but I see no attempt in going further. This is the only type 174 picture I have seen. Not a 100% normal kdf-engine as you can see. As said before the type 174/174A is somewhat of a mystery. In this post I'll try to cover the first one, the type 174. 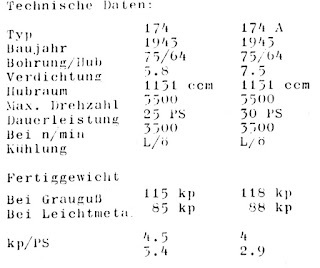 Looking at the technical data it looks like your normal post-war 1131 cc with 25 hp and a 5,8:1 compression ratio. But the only picture of a 174 I have found show some strange things. First there is a bulky device where the distributor should be, which seems to be some kind of magneto device. 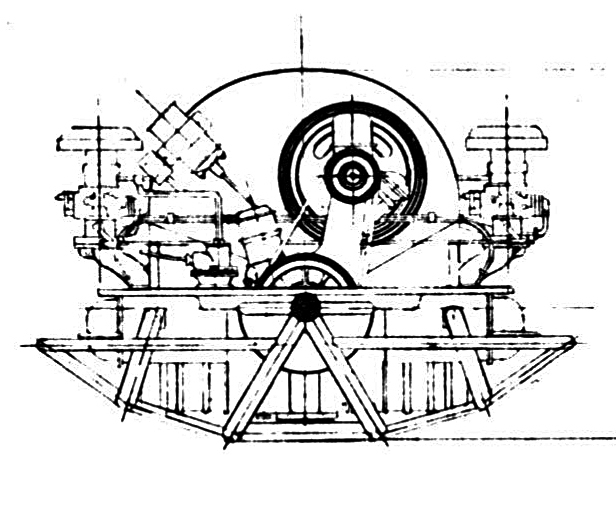 "Normal" kdf-stationary engines did have a bulky magneto device somewhat similar to this one on the type 174, while the type 171 had a Scintilla device of the type used on post-war stationaries. I guess they tried out different types during the war before they settled for the Scintilla type. 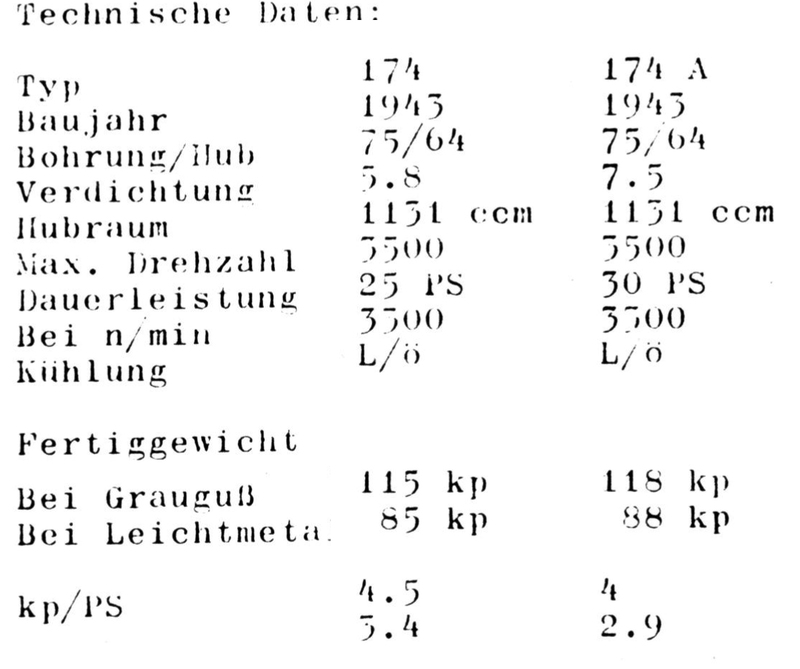 Technical data of the type 174/174A. The second thing is the carburetor that looks a bit different from other ones from that time. 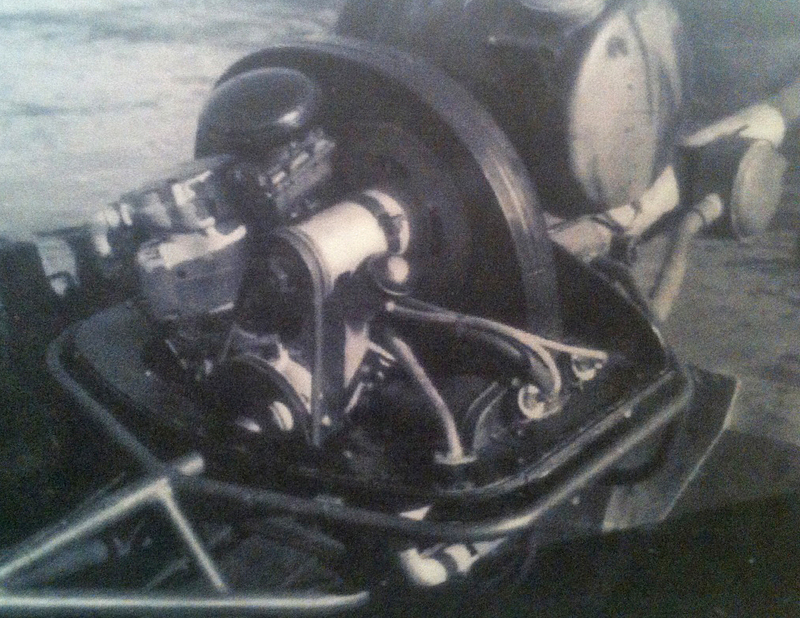 It it's a Solex 26vfi II with dual float bowls that was also tested on the Schwimwagens*. Perhaps it was an attempt to try out a carburetor more suitable for use in a boat application? And that's all for the type 174. I have no more at this point in time. Next up is the 174A. *Edit note: I did update this blogpost with additional information from Dieter and Lucian. Thank you! 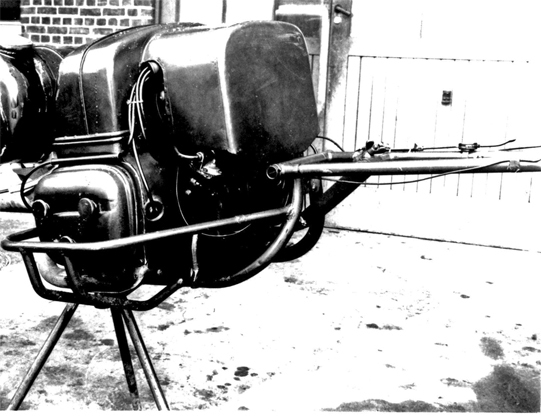 The first version of the type 170 featured a top mounted Roots supercharger, the photo was taken in March 1943. This blogpost was supposed to be about Sturmboot prototypes type 174/174A, but when asking my source some follow up questions I received some more very interesting information. So until this new information is digested I will wait with the174/174A post, but until then I have some new findings related to type 170 I want to share. 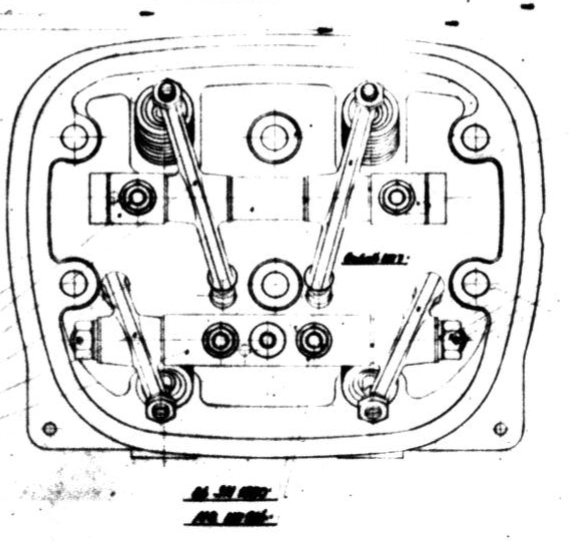 As it turns out, type 170 were built in two versions: One with the Roots supercharger on top of the engine and one were it's axial mounted in line with the crankshaft. The first one is labelled version one and the photo is dated March 1943. The latter does only say type 170 and 1943, with no further details. The new photo material of Sturmboot prototypes I got show different versions of prototypes and even complete units that appear ready for the sea. This put my statement in earlier blogposts in a new light. Probably no one knows for sure anymore how many prototypes were made. Next in line for the air-cooled Sturmboot project was project 171. This time a normally aspirated 1131cc pushrod engine with hemisphearical combustion chambers. The inspiration of the heads seems to origin from the pre-war SOHC type 115, but this time a bit more conventional using pushrods from a centrally placed camshaft. To me it's a mystery why they did chose to go to this rather complicated design instead of increasing the cylinder volume, a solution that would have required less amount of new parts. Somehow I have the feeling Porsche took this military order as an opportunity to make designs that could be useful in future projects after the war. According to my source document this rather novel design was scrapped due to the cost (and probably time) it would take to put it into production. Not many details remained unchanged from the original kdf-design. As can be seen not many parts are interchangeable with the original kdf-engine. A fact that was to be the fall of this concept. But how far did the development of this engine go before it got stopped? 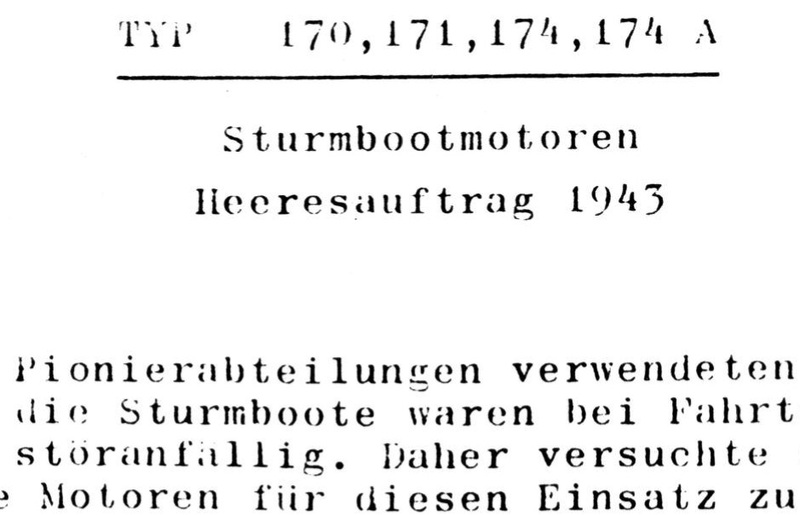 Both the document I have access to and Chris Barbers book "Birth of the Beetle" indicates that of the different air-cooled Sturmboot designs only type 174 was ever tested in a the real application. However, from the picture above we can assume that a prototype of the 171 was made. According to one of the worlds leading kdf-experts only one prototype of each (170, 171, 174) were made and they were all later scrapped in Linz/Donau in 1960. Some believe that 171 heads were used by Kurt Khunke in his VLK (Vollstromlinien-Leichtbau-Konstruktion) in which he won the 1947 Braunschweig Autobahnrennen (first ever victory for a kdf/VW based vehicle). This has not been confirmed and if only one prototype of a complete 171 was ever made this seems highly unlikely. From the design it is obvious that these heads can not be used on a kdf engine as the case is very different. My conclusion is that we can probably rule out that the 171heads were ever used in racing applications (I welcome any fact that can strengthen my theory, or destroy it). In some current litterature the V-heads in Peter Max Mullers race car, displayed at the Prototyp museum in Hamburg, are referred to as Sturmboot heads. 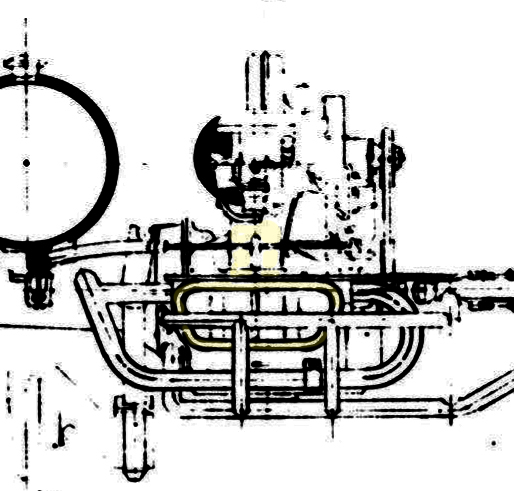 Looking at this picture, showing one single valve cover for two cylinders, I think we can safely rule out that connection. If anyone has more information, please contact me! If new information surfaces I will share it on this very blog.